Although this species has a restricted range within South Africa, it is widespread and common outside of South Africa and not threatened. 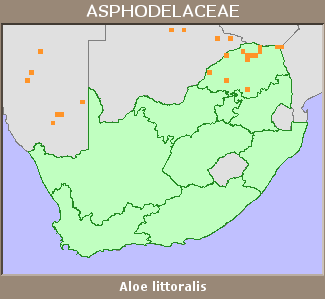 Limpopo Province north of the Soutpansberg, but widespread elsewhere in southern Africa, including Angola, Namibia, Botswana, Zimbabwe and Mozambique. Mopani veld and dry open woodland. A. littoralis is rare in South Africa but not threatened (Van Wyk and Smith 1996).